In a few days time Samsung will be making available their new Notebook 9, Notebook 9 Pen and Samsung 7 Spin notebooks after first unveiling them back during the Consumer Electronics Show 2018 last month. The new systems will first be made available throughout the United States from February 18th, 2018 onwards and are expected to roll out worldwide in the following months. The convertible notebooks are now thinner and lighter than previous models, although Samsung seems to have included a slightly underpowered battery, offering a little less battery life than most would require. According to some reviews already conducted by technology websites. As far as specifications go the Samsung’s 13 inch Notebook 9 comes with option to install either an 8th generation Intel Core i5 or a Core i7 processor. While the larger 15 inch model can be equipped with NVIDIA GeForce MX150 graphics if desired for an extra $200 and comes fitted with an Intel Core i7 CPU as standard. Both versions are equipped with USB Type-C ports and the larger 15 inch model is also fitted with a Thunderbolt 3 connection. 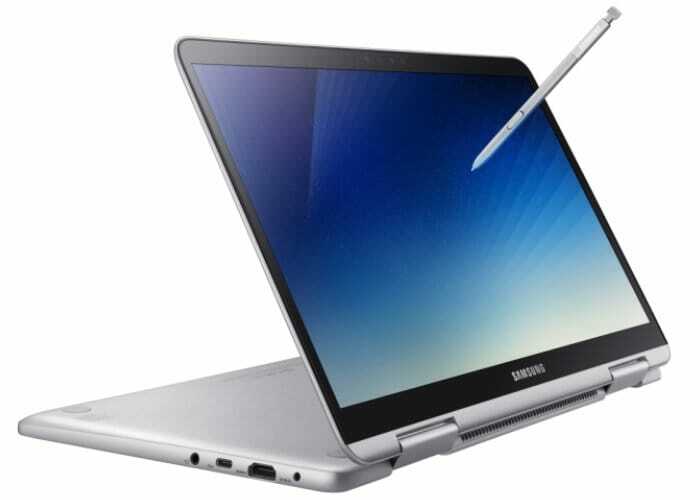 The Samsung Notebook 9 Pen as the name suggests come supplied with the Samsung S-Pen and is equipped with a Core i7 processor, 39Wh battery, a USB Type-C port, and a touchscreen display complete with 360-degree hinge and handy USB Type-C for fast data transfers. The Samsung Notebook 7 Spin 2018 model will be priced at $900, while the Samsung Notebook 9 Pen will be priced at $1400, with the 13 inch Samsung Notebook 9 price from $1200 and the larger15 inch Samsung Notebook 9 2018 model priced from $1300.